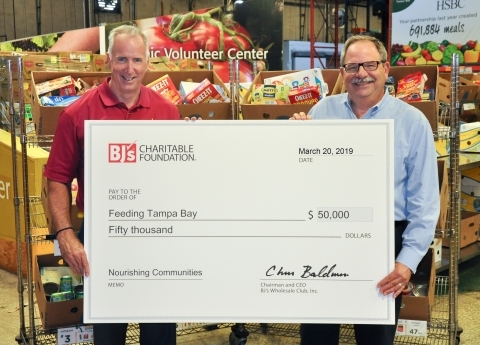 WESTBOROUGH, Mass.--(BUSINESS WIRE)--BJ’s Wholesale Club (NYSE: BJ) today announced a $50,000 donation from the BJ’s Charitable Foundation to Feeding Tampa Bay, a Feeding America® member food bank. BJ’s donation will provide fresh, nutritious food to people who are food insecure and lack consistent and easy access to healthy meals. The donation also celebrates BJ’s upcoming club opening in Clearwater, Florida. BJ’s biggest advantage is value. BJ’s beats supermarket prices on national brands every day, saving families up to 25 percent on groceries*. Its exclusive brands, Berkley Jensen® and Wellsley Farms®, bring real families real savings on quality products with a 100 percent money-back guarantee. Members can save money and time by filling up their tanks at BJ’s Gas®. The company’s gas prices are among the lowest around. Everyday ClubVenienceSM. BJ’s Wholesale Club helps members shop faster and save easier with convenient shopping options like same-day grocery delivery,buy online and pick up in-club, digital Add-to-Card coupons in the BJ’s app and an expanded assortment on BJs.com. Headquartered in Westborough, Massachusetts, BJ's is the leading operator of membership warehouse clubs in the Eastern United States. The company currently operates 216 clubs and 138 BJ's Gas® locations in 16 states.